Mary Louise Miller (second from right) was inducted into The Indiana Academy on Monday night. 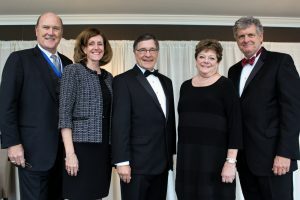 Pictured with her (left to right) are Christopher Murphy, chair of The Indiana Academy Board of Regents, Jane Magnus-Stinson and Eugene Habecker, fellow inductees, and David Wantz, president of Independent Colleges of Indiana. Community leader and Grace College benefactor Mary Louise Miller was inducted into The Indiana Academy on Oct. 15. 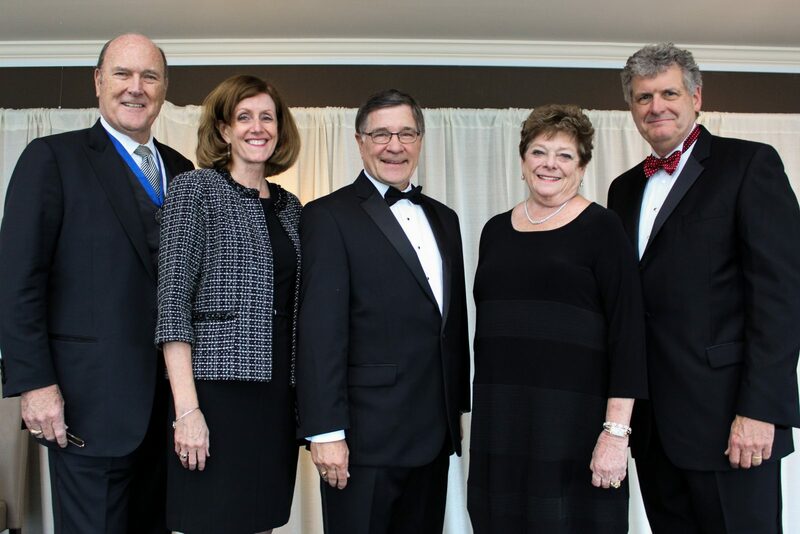 The 48th annual dinner celebration in Indianapolis honored three new inductees for their lifetimes of achievement and contributions to the State of Indiana. Modeled after The French Academy, The Indiana Academy was established in 1970 by the Independent Colleges of Indiana to recognize individual leadership, achievement, and philanthropy to promote the advancement of the state and its sector of independent higher education. Mary Louise and her late husband Dr. Dane Miller are largely responsible for the development and success of the Village at Winona in addition to founding local orthopedic giant Biomet. Mary Louise also founded ML Motorsports which competed in the NASCAR Nationwide Series and is recognized as the first NASCAR team to be jointly owned by a mother and daughter. Miller now serves as president of the Dr. Dane and Mary Louise Miller Foundation that provides financial assistance to hundreds of charitable organizations and educational scholarships to Hoosiers. She has been a strong supporter of higher education in Indiana, especially at Grace College. She currently serves as the honorary chair of the Grace College & Seminary Aspire Campaign and as an adviser to the president on community issues. President of Grace College and Seminary, Winona Lake, Ind., Dr. Bill Katip introduced Mrs. Miller at The Indiana Academy celebration dinner. A lasting tribute to Mary Louise’s vision and exemplary life of generosity is the opening of the Dr. Dane A. Miller Science Complex at Grace College. Named in honor of the couple’s vision-casting and contribution to the state-of-the-art science and mathematics facility, the complex was formally opened and dedicated on Oct. 5. For more information about The Indiana Academy and its members, visit icindiana.org/our-programs/the-indiana-academy/.